Keep is simple, but significant. The Best Air Cleansing Plants for Home. By Swell Made Co. Photo by Chantelle Watt Photography. Plants make people happy and do us good. It's true! Actually, it's scientifically proven. If you're an urban dweller like me, plants are a simple way to connect with nature on a daily basis. Houseplants bring beauty into our homes by elevating spaces, but they also help us feel creative and rejuvenated. Best of all, common indoor plants are capable of cleansing the air in your home. NASA's Clean Air Study suggests that plants are capable of naturally removing common toxins such as formaldehyde, xylene, ammonia and benzene (found in paints, glue and other household items). While it might seem like magic, the higher oxygen levels naturally provided by plants have been proven to improve health and well-being. So, which plants are best for cleansing the air in your home? While, any plant will do, here are some of my favourites that are easy to love and care for if you're not a green thumb. If you're a plant killer, perhaps you should check out our Plant Lover collection. The Best Air Cleansing Plants for Home. By Swell Made Co. There are many more air cleansing plants out there. Just ask when visiting your local plant shop or florist, these are great to get started and can be found commonly. Keep reading below to learn more about each variety. Snake Plant - The Best Air Cleansing Plants for Home. By Swell Made Co. Photo by Chantelle Watt Photography. The snake plant (sansevieria) has incredible air-cleansing qualities removing four of the five most commonly found household toxins. The snake plant (also called mother-in-law's tongue) is super low maintenance. It requires low to moderate light and low water making it a breeze to care for. Ridiculously easy. Hang this dramatic fern (nephrolepis exaltata) in bright light and it will happily help cleanse the air in your home. Large and leafy this beautiful fern does require quite a bit of moisture even though it's considered easy-going. From this list, this plant requires the most care. Just give it regular mists and you'll both be happy! There are 40 different kinds of dracaenas plants, so they're easy to come by. Red-edged and cornstalk are well known vareties. Another power houseplant, it removes four of the five most common toxins found in the home. Place it in a spot with bright to indirect light and water moderately. Keeping the soil moist, but not soggy is key to caring for this plant. Fiddle Leaf Fig Plant (#plantgoals). The Best Air Cleansing Plants for Home. By Swell Made Co. Photo by Lauren Mancke. Bring the Bamboo or Lady Palm into your home for a bohemian or tropical vibes and some serious air cleansing plant power. With a penchant for formaldehydes, benzene and carbon monoxide, these plants are more than just pretty. Plus, they are natural humidifiers as well. Easy to care for bamboo or lady palms require bright to indirect light and moderate watering. They can grow quite large given the space (larger pot) to grow. A common variety of the philodendron plant is the sweetheart plant with its adorable heart-shaped leaves. There certainly is much to love when it comes to this plant, with it's cleansing abilities and it's super low-maintenance nature. It can trail and creep around your spaces, which makes it even more endearing. Like most of the plants listed here, it requires bright to indirect light and moderate water. All of the plants mentioned above thrive best with well-draining soil, so the roots don't drown/rot. Happy houseplant hunting and loving! Simplicity makes room for the important things in life. 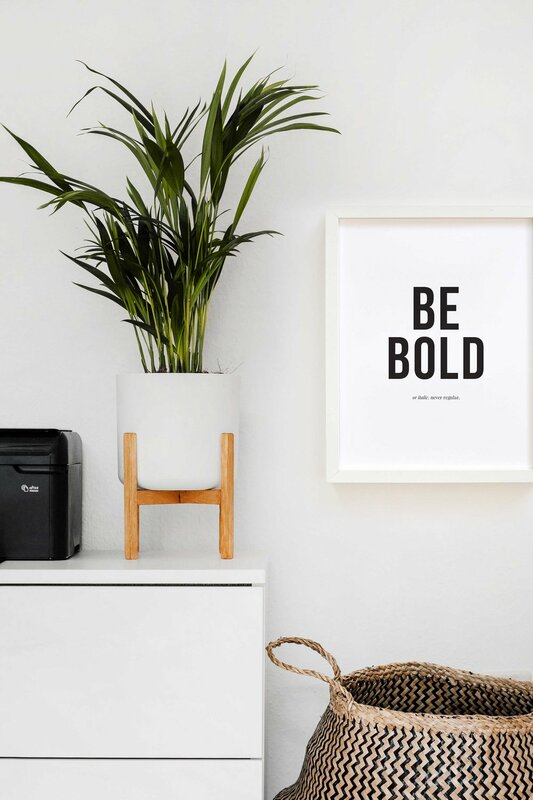 Swell Made Co. is a Canadian brand that designs simple, yet bold paper goods, home décor and gifts for swell people, like you. Inspired by our mantra – “keep it simple, but significant”. Here on the blog, The Swell Life, you'll find posts about the simple things in life that bring delight. Want to hang out? It’s simple! Join our community and enjoy The Swell Life. Plus, you’ll get 10% off your first order! That’s swell. Your information will never be shared. We promise. HOORAY! You're swell. Thank you for signing up for our offer and newsletter. You will receive a promo code within 24-48 hours. HOORAY! You're swell. Thank you for signing up for our offer and newsletter. You will receive a promo code momentarily. Copyright Swell Made Co. 2019. All rights reserved.